Hello friends and happy Wednesday! Madeline and I are here with another coordinating outfit for fall. 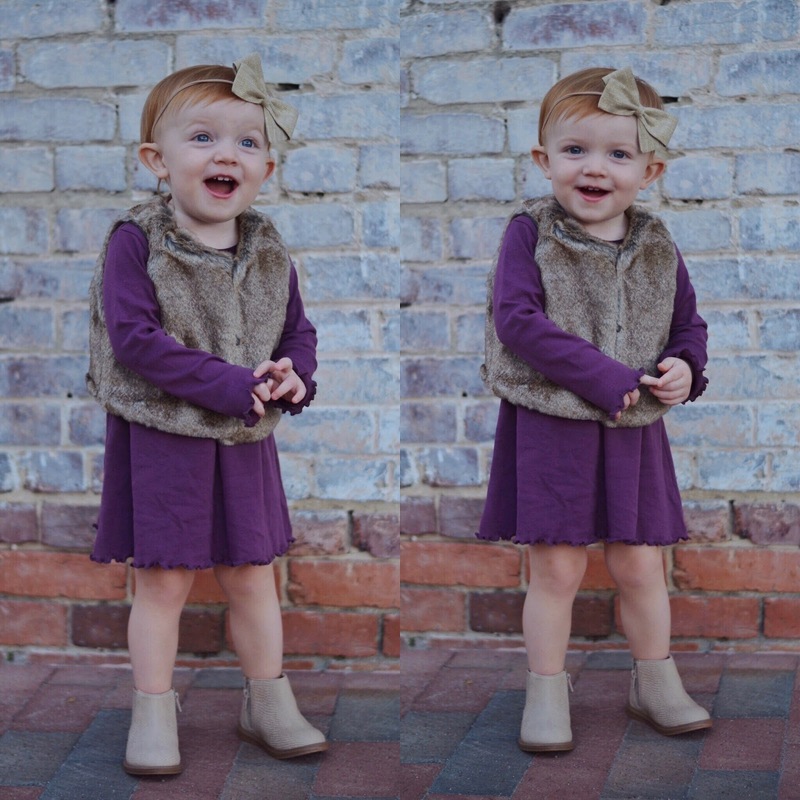 Goodness these tiny little pieces (like the faux fur vest she is wearing) just get me every time! Ever since she saw me pull out my riding boots for the first time this fall, all she wants to wear are her boots. She'll choose boots over any other shoe, especially her baby Hunter Boots (She'd sleep in them if I let her haha). When she sees me put mine on, she'll run to her shoe shelf and grab her boots as well. I am always so amazed to see how quickly she picks up on things and how much she understands. She is at such an active age, and even though she keeps me on my feet, it is so much fun to watch her and her little personality shine through. She keeps me smiling and feeling so grateful to be her mama. 😊 This time of year is especially so fun with a toddler. We went to a local farm last weekend for some pumpkin patch exploring, corn maize fun, and more. She had an absolute blast, especially meeting all of the animals there. Her love for animals melts my heart each time and especially when she lets out a long, drawn out "awwww." I have some iPhone snaps from our time at the farm, and I will be sharing those soon! Thanks so much for stopping by! Have a great Wednesday. She is so sweet and stylish!! You too, mama! LOVE!!! Y'all are adorable. LOVE the colors. My Mercy --- Madeline gets more adorable every day! Ya'll look so cute. I just got this sweater in grey and love it! It's so comfy and I think I need the wine color you have! I just love the colours you are mixing! I am totally obsessed with those shoes too!! Super cute! I adore this! SO chic!! 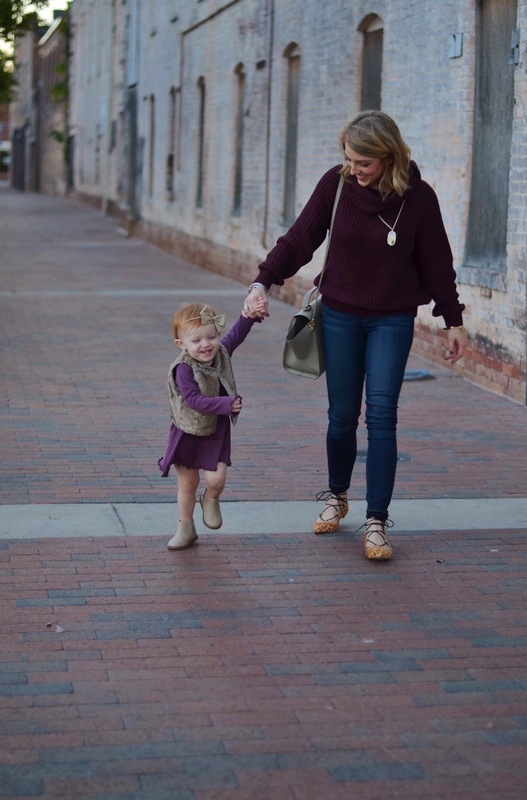 These pictures are so cute, Rachel- Madeline is totally your mini me! I love your sweater too! Loving that color on you and those flats - so cute. 1. she is sooooo cute!!! 2. love your shoes! Both of y'alls outfits are so cute! Love the purplee. I love your sweater and she is so freakin' adorable I can't stand it! So cute that she loves her little boots! Y'all are so cute!!! I love that purple sweater. So comfy and cozy. Your girl is so cute. 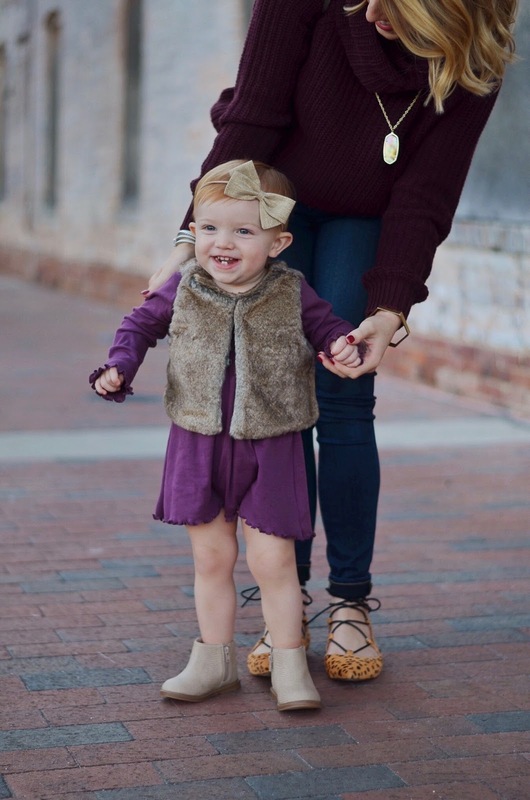 Love both your and your baby girl's autumn looks. Y'all are so sweet! I love little girl's clothes, so many adorable things! You both styled your outfits very well! OMG loving both of your outfits! 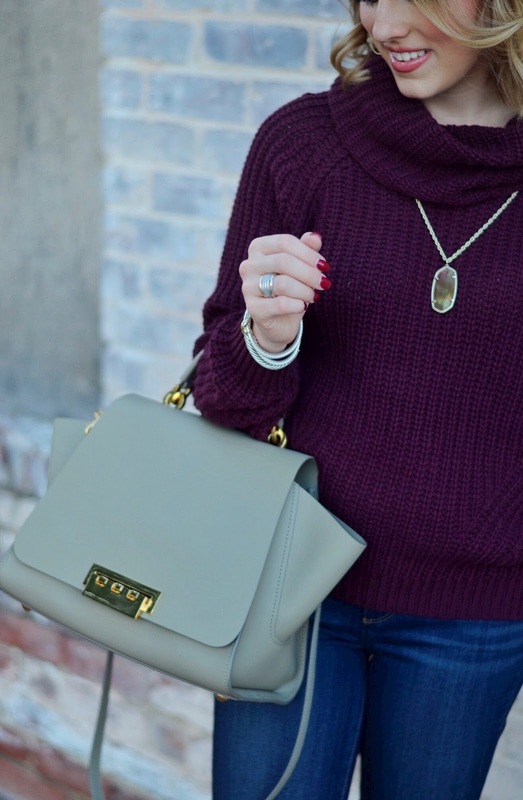 Plum is definitely one of my fave colors this time of year! Such a cute outfit! I love that you mix high/low fashion. I'm in my 60s and really love your outfits and copy many of them! As much as I love your outfit, sweet Madeline steels the show! She is just adorable and I love to see her! Oh my goodness she's a doll!! Loving you girls in plum! Y'all are the absolute cutest little family ever! My favorite photos from when I was a little girl are photos of my momma and I matching, but we were nowhere near as stylish as y'all! Haha. That bag is awesome! And she looks so cute in her little fur vest!